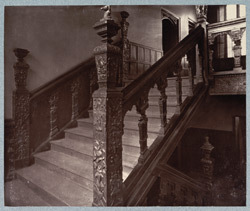 The Great Staircase is "...a very beautiful example of late sixteenth century work, being of the same date as that in the interior of the Great Hall...now used as a dining-hall of the pensioners. The decorations of the interior, a most beautiful example of the Renaissance, are almost entirely the work of the Duke of Norfolk, whose initials, T. N., with the date, 1571, are found in the carvings." Letterpress by Alfred Mark from 'Photographs of Old London'.